Learn performance skills, story structure, and collaboration, all in a team-focused and wildly imaginative environment! Ever daydream about having super powers? Ever spend time twirling an imaginary mustache, or perfecting your evil laugh? Well, Theater Adventure is a place to bring out your inner superhero and villain (not to mention goofy sidekicks and mysterious shapeshifters), as we create scenes borrowing from the best action-adventure and superhero stories. Students will have the chance to create their own characters, and the costumes to go with them, including super-powers and weaknesses – even secret identities. Class activities will include theater and improv games, scene writing and character work, as well as crafting the masks and props needed to present our stories. We’ll also create commercials for ridiculous products (Such as a fork fashioned from noodles, or a dog-food scented perfume! ), to intersperse with our adventure scenes. Students will learn performance skills, story structure, and collaboration, all in a team-focused and wildly imaginative environment. The week will culminate in a unique workshop performance for other Lexplorations classes, as well as friends and family. Poornima Kirby is a freelance acting teacher. She teaches with Actors Shakespeare Project, is currently directing at Newton South High School, and has taught with Lexplorations since 2014. 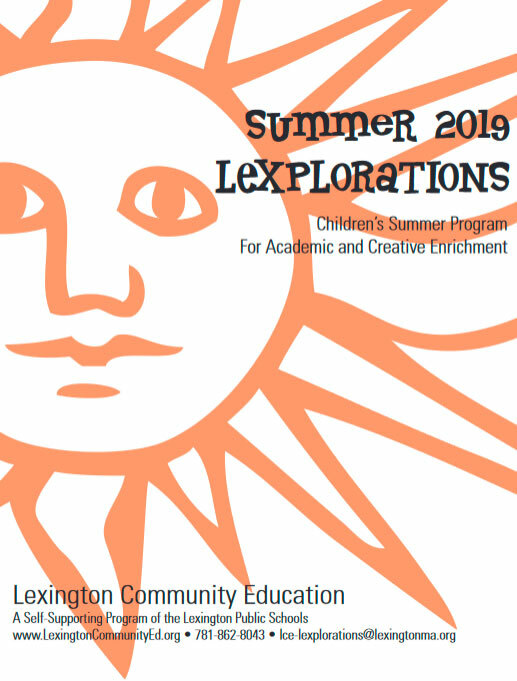 Visit our website at lexingtoncommunityed.org to register using a Visa or MasterCard. Use the registration form on the back page of the print catalog. Complete the General Release and Waiver of Liability form and enclose a check made payable to: Lexington Community Education or provide your Visa or Mastercard number on the form. Before June 27th: The LCE/Lexplorations office, located at 146 Maple Street is open from 9-3, Monday through Friday. Our Lexington High School Office is open from 4pm-9pm Monday through Thursday while classes are in session. After June 27th: The LCE/Lexplorations office is located at the Estabrook school in room 101. Completed registration forms may be faxed to the LCE office at 781.863.5829. Lexplorations registrations can not be processed over the telephone. Preregistration is required for all classes. When the Lexington Public Schools are closed, our classes (both on and offsite) are cancelled. For weekday afternoon and evening classes, if the schools close early or suspend their afternoon programs, our classes are cancelled as well. (c) Copyright 2003 – 2019 Lexington Community Education.